Many of our children go on to develop their aquatic skills in activities such as triathlon, underwater hockey and competitive swimming clubs (City of Glasgow, Ren96 and Kingston ASC). 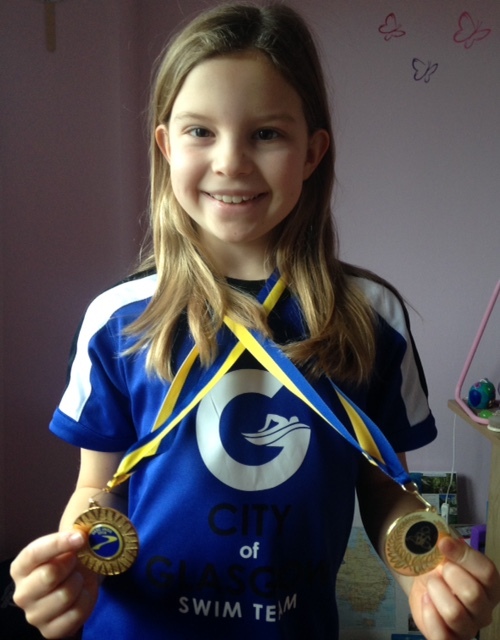 Well done to Coco for winning 3 medals in the Glasgow Schools competition. In the 10 & under category, Coco won a gold medal in 25m backstroke and a bronze medal in 25m freestyle. As part of the Hutchesons' Grammar School freestyle relay team, Coco and Aneesa both won silver medals as well. Congratulations! Well done to Emily for participating in the Balfron Aquathlon and winning 3rd place in the 8 year old category. Congratulations! Well done to Maya for competing in the Grangemouth Jags meet. Maya won 2 gold medals in the 9 & under 50m butterfly and 10 & under freestyle relay as well as 5th place in the 9 & under 50m backstroke. Congratulations!